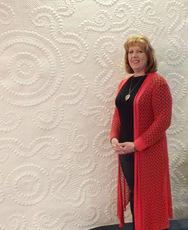 Our speakers left us all with a lot of food for thought – Sandy Chandler our morning speaker is a professional long-arm quilter. What a feast we were given, Sandy told us that she had begun long-arm quilting quite by chance after moving to Cornwall. Some of her wholecloth quilts were a good 110″ square and very closely quilted with some trapunto style work. Listening to her explain how she creates the quilting designs with her clients, showed us that she gives great thought and care to what the client feels about the quilting she needs on her work. A very talented lady. After lunch our speaker was Irene MacWilliam who came all the way from Northern Ireland. Irene took up patchwork in about 1985, although she did not really feel that traditional style was really her style, so worked on machine appliqué. Irene’s style is very individual with free machining and other techniques, incorporating text, which is hidden within the piece. For some time now her quilts have been made based on Events of the Year, the quilts consist of small picture panels which depict events around the world. 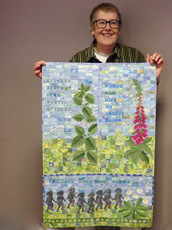 We were treated to a power point presentation of many of these very imaginative quilts. The work was stunning and showed many different styles and techniques. All this delivered to us with a great deal of humour. I don’t think anyone wanted the talk to finish.